While the 2015 FIS Alpine World Ski Championships in Vail and Beaver Creek will showcase the world’s top ski racers, the event will also serve as the canvas for one of this country’s premier artists as internationally renowned painter and Vail gallery owner Carrie Fell has agreed to become the Official Artist for the 2015 Championships. In addition to creating the artwork for the official World Championships poster, Fell will also be working with local children to create a special art piece, while also embarking on other unique merchandising, marketing and design concepts throughout the event. Fell’s art depicts the traditional icons of the Old West with a thoroughly modern twist, using vibrant colors and fluid forms. Her colorful cowboys represent a spirit of the West, emerging as a modern tribute to America’s past. 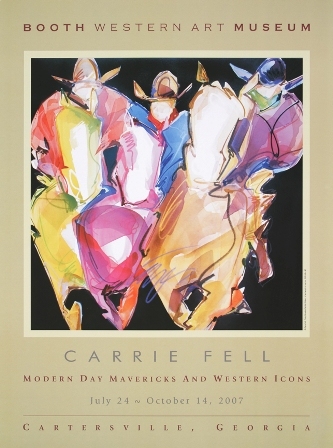 Painting professionally since 1988, she is one of only two contemporary-style Western artists whose work was chosen for the prestigious 2003 “Legends of the West” exhibit at the George Bush Presidential Library and Museum in Texas.Her original work also hangs in the prominent permanent collections of the Booth Western Art Museum in Cartersville, Georgia and the Desert Caballeros Museum in Wickenburg, Arizona. She opened her Vail gallery, located in the Solaris complex in December of 2011. Beyond creating art, Fell enjoys working with young students through her “Significance of Self Program of the Arts for Children”, which has been presented at schools in Colorado, Oklahoma and Tennessee, featuring a curriculum that helps children express their inner passions through the medium of art. Fell comes by her affinity for the Vail Valley naturally, having grown up skiing with her family in Vail. For additional information on the 2015 FIS Alpine World Ski Championships in Vail and Beaver Creek, visit www.vailbeavercreek2015.com. For more information on Carrie Fell, check out www.carriefellgallery.com.